You understand the purpose and importance of the CX flywheel, but do you have the tools required to firmly place the customer at the centre of your operations? It may be a significant undertaking, but with the right technology and improved transparency, you can help your business get ahead. In the following article, you’ll find information and advice to help you choose a technology platform to improve your customer experience across marketing, sales and service. While the technology and tools described below are a powerful asset to nearly any company, the reality is that they are only effective when paired with smart customer segmentation. You must understand your audience first. Only then will you be able to fully leverage your technology investment—no matter how advanced. Are they investing in ongoing research & development and innovation? Does the technology truly cater to the different stages of the customer journey? Are there cases to demonstrate this? How easy is it to integrate the technology with other technology platforms? How easy will it be for marketing, sales and/or support teams to use? Will the technology allow these teams to be self-sufficient, or will they still be reliant on coding and development support? What does the onboarding programme look like? What support channels are available once signing on? Does the partner offer a series of demos and/or a trial period for their technology? With these considerations in mind, Perceptive partnered with HubSpot as a Gold Tier Partner. We believe it is a platform that allows for powerful business transformation—offering everything that marketing, sales and service teams need to work effectively, all in one place. HubSpot offers a single customer view across marketing, sales and service, ensuring greater transparency of the customer journey. This eliminates inefficiencies that come with trying to combine customer data from separate tools and databases. A unified view also facilitates alignment and collaboration across the business, which empowers teams and reduces customer friction. 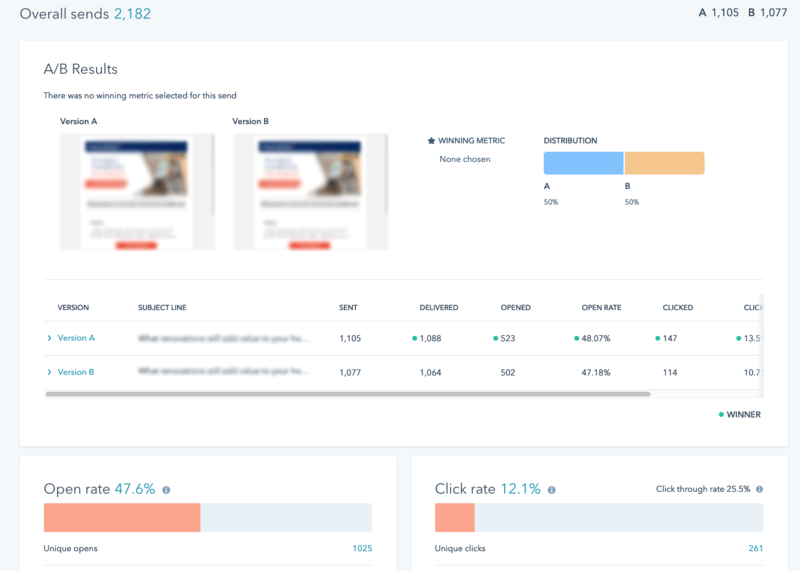 Within HubSpot, teams can see every detail about a lead or customer and chronological timeline of every touchpoint between them and your business. 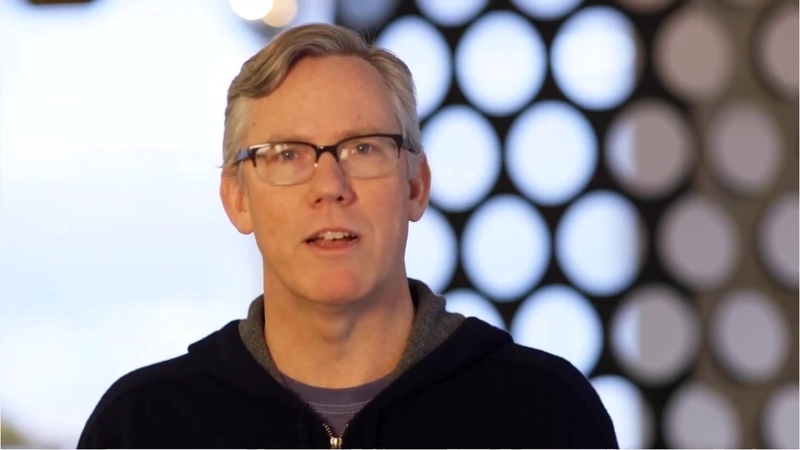 HubSpot makes it easier for businesses to create and manage their buyer personas. By placing buyer personas at the centre of your customer experience strategy, communication with customers becomes more targeted, relevant and effective across the business. Strategies that aren’t fueled by personas are not only less effective, they can also create friction between divisions leading to a poor customer experience. For example, a persona disconnect between marketing and sales reps can lengthen sales cycles and even prevent deals from closing. HubSpot puts personas at the centre of your strategy. This leads to more tailored communications and improved customer experience. Technology ceases to be useful when it can not keep up with the evolving needs of a business and, ultimately, its customers. 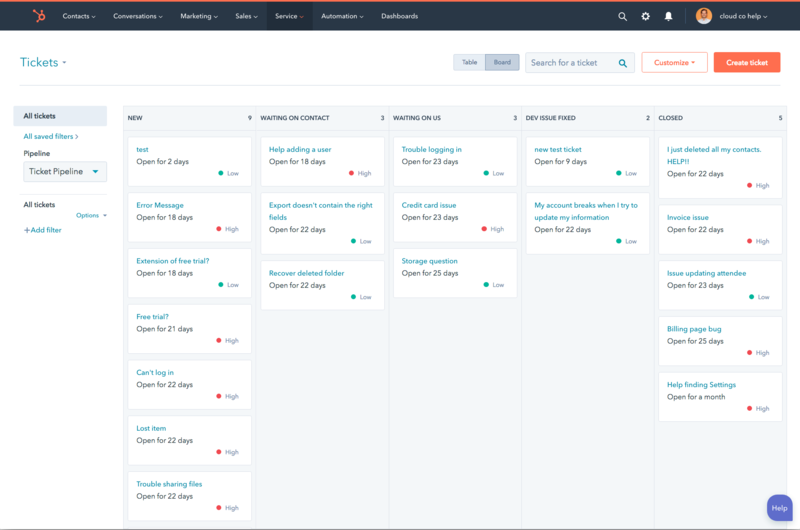 With investment in R&D sitting at over US$26 million per quarter, HubSpot is constantly introducing new features and improvements. They understand and anticipate the ever-changing needs of marketing, sales and customer support teams. HubSpot also makes it easier for business to ‘discover and connect’ to other successful tools to help them grow. 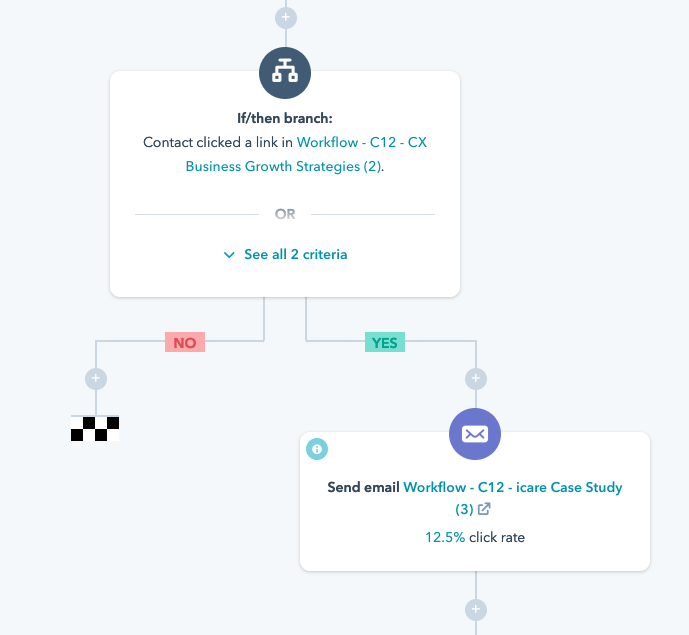 The HubSpot Connect ecosystem features a number of useful integrations including Shopify, Workflow Max, MailChimp, Facebook, Salesforce, and many more. Information is the key to launching hyper-targeted, hyper-effective marketing campaigns. Valuable data such as what pages or content customers and prospects engage with, as well as their behaviours leading up to and after that interaction, can provide insights that guide marketing strategy. More often than not, this data is not available to the average marketer. HubSpot not only provides marketers with all this information, it gives them the tools to segment their audiences in new and exciting ways. As a result, these marketers can produce campaigns that target desirable segments with more meaningful, more useful and more timely content. Attempts at nurturing contacts, no matter how simple, require time and resource. Gathering data on visitors, prospects and customers is just the beginning—marketers then need to create, send and monitor engagement with the content they distribute to these audiences. Through smart automation, HubSpot allows markets to personalise the customer journey by leveraging individual behaviours and characteristics to trigger the right email, content or offer. Marketing is as much a science as it is an art: constant review and improvement is an absolute necessity, usually in the form of A/B testing. HubSpot has this functionality built into the platform, allowing marketers to test and learn how different layouts, creative, messaging, CTAs, workflows and more can positively impact key engagement metrics such as conversions, cart abandonment rates, bounce rates, click-through rates, time on page, and much more. HubSpot allows marketers to quickly and easily perform sophisticated A/B tests to fuel continuous improvement. Generating a consistent number of good leads for your sales team is one thing, but how do you go about quantifying just how “good” one lead is over another so your sales team can prioritise follow-ups and their focus. HubSpot allows marketing teams to automatically assign custom lead scores based on behaviours or characteristics. When a lead hits the quality threshold set by your team, a sales rep can be immediately assigned and notified. 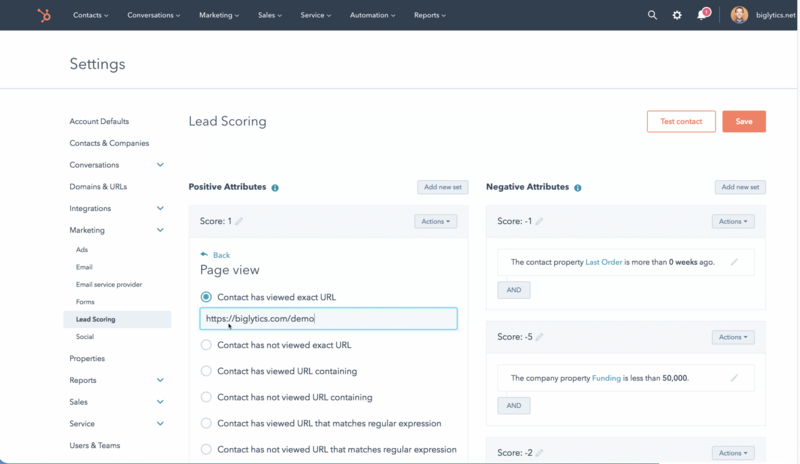 HubSpot’s lead scoring feature makes it easier to identify and prioritise the most qualified leads. Organising, tracking and growing the sales pipeline can be a challenge for any sales team. HubSpot makes this process straightforward. You can set up and manage a pipeline that is dedicated to the path-to-purchase of your ideal customers. Deal stages and properties are simple for sales teams to adjust and do not require any support requests to be logged with IT. Similarly, tasks and follow-up reminders can be assigned in seconds to help keep opportunities moving through the pipeline. These reports help sales managers identify what’s working (and what isn’t) and focus the team on those areas that matter most. Salespeople only spend about a third of their working time actually selling. The rest of their day is spent on admin related tasks—tasks that could be automated. A contact’s behaviour and activity is automatically captured and logged, cutting out the need for manual data entry. Leads can be assigned, deals set up, tasks created and reminders scheduled automatically, saving valuable time. HubSpot allows leads to access the calendar of the sales reps they would like to book a meeting with so they can choose a time on the spot that suits them both. 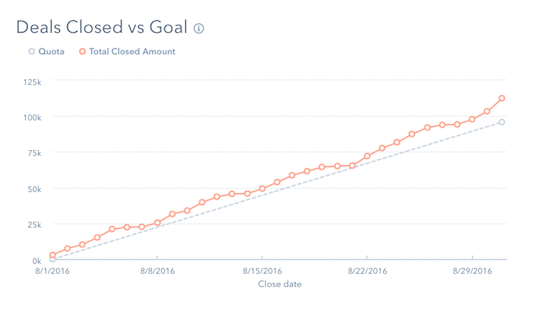 HubSpot capitalises on lead activity and behaviour to prioritise sales calls into a daily calling queue. 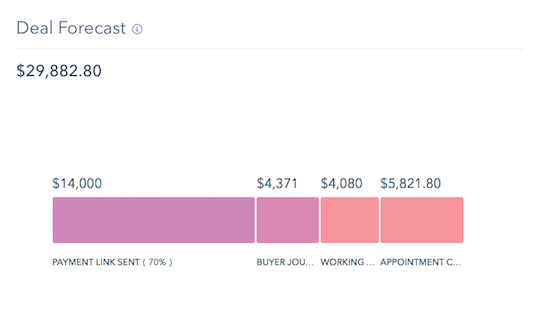 Calls can be made (and recorded) via the HubSpot dashboard and are automatically logged against a lead. HubSpot allows sales reps to turn regularly-used emails into templates that can be tracked and optimised over time to improve their performance. These templates can then be shared with the wider sales team. Having the ability to follow-up with the right leads, with the right content at the right time can drastically improve a sales team’s performance. HubSpot gives sales reps this ability. As soon as a lead opens an email, views a proposal, looks at an online pricing page or performs a number of other qualifying activities, sales reps are automatically notified. This not only helps them prioritise their focus, but also time their follow-up while they are still top-of-mind and shorten sales cycles. HubSpot also allows sales teams to automate a sequence of follow-up emails (without sacrificing personalisation) that are delivered only when a lead meets specific criteria e.g. watched a demo video for a second time and viewed a proposal three times. Use HubSpot to automate follow-up emails. If that’s not enough, sales reps no longer have to simply rely on their own instincts. HubSpot allows sales teams to leverage the power of machine learning to deliver emails and proposals to leads at the times when they are most likely to engage. Customers want to connect with companies and brands using new channels, including chat and social. Businesses that are eager to please are integrating an increasing number of channels into their customer communication strategy. However, most businesses have siloed channels, which undermines the customer’s experience. A customer may log a request via chat, provide additional detail, such as screenshots via email, and then follow-up by phone for an ETA. Unfortunately for many service teams, they have no way of easily connecting these conversations. This disconnect often results in frustrated customers. HubSpot overcomes this challenge by bringing all your communication channels into a single dashboard. Within this dashboard, service teams can see every interaction a customer has had with the business across all channels. Teams are therefore better equipped to collaborate and solve customer issues. 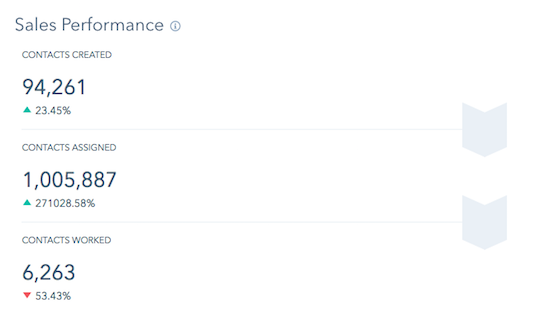 Replies to customers can also be sent directly from the dashboard and are automatically delivered to the channel that the customer reached out on. As a business grows, scaling up customer service can be a very real challenge. This is because more customers generally result in an increase in the number of support requests. If there is no way of accurately managing and monitoring these requests, the resulting delays lead to unhappy customers. 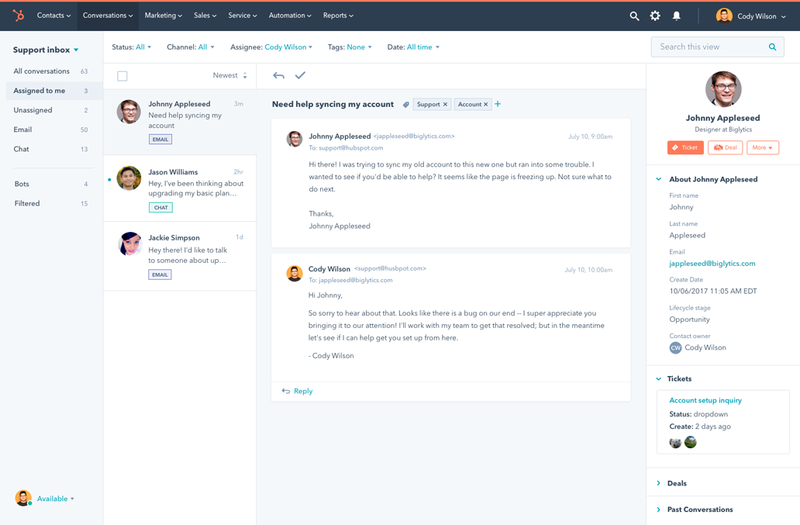 The HubSpot help desk and ticketing system makes it easy for customer service teams to manage, track and follow up support requests via a single dashboard. Within the dashboard customer service agents can access a customer’s full history, view open tickets, and, if necessary, collaborate to find a speedy resolution. Automation and routing rules can also be easily applied to support tickets for the most efficient resolution. The single dashboard view also benefits customer service managers by giving them complete visibility over the service pipeline, allowing them to quickly identify stalled tickets, as well as trends that could potentially impact the wider customer base. 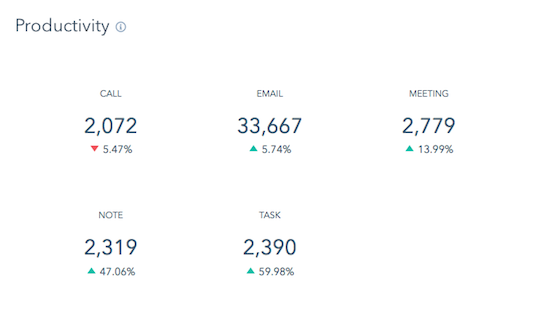 The dashboard also puts a wealth of performance metrics at their fingertips, including number of tickets closed/open, time to resolution and team activity. With HubSpot you can automate tickets to create a help desk. FAQs exist for a reason, but sometimes this shortened, quick-answer format isn’t going to provide enough information. Sometimes questions need full-length, article-style answers, but such things aren’t always appropriate for a blog post. It reduces the time support agents spend answering recurring questions. It equips support teams with a directory of information, empowering them to deliver consistent solutions for customers. It satisfies the need many customers have for an immediate self-service solution. Self-service options are becoming increasingly important for customers; people are becoming more and more used to quickly resolving issues themselves without having to go through a company representative. However, sometimes even the best-written knowledge base solution may not be able to resolve a customer’s problem. This is where HubSpot’s live chat excels, connecting support teams with customers to immediately resolve their issues—whether that’s technical issues relating to a product or simply needing more information about a recent promotion. 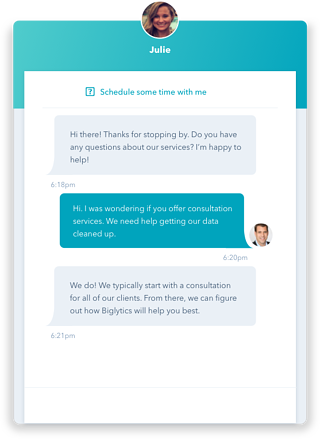 For common questions the replies can be automated via a chatbot, once again freeing up service teams’ resources to focus on complex questions as well as giving the customer what they crave most: immediate support and solutions. HubSpot’s live chat excels, connecting support teams with customers to immediately resolve their issues. Interested in learning more about HubSpot and how it can help you business? Request a free demo from one of our CX experts now.